Because your day is long and your tasks are sometimes all over the board, you know it’s important sometimes to have a pair of women's shoes that can take you from errand to task to work and back again. If you can find a pair that accomplishes just that - and does ... (see full details) (see specifications) #TB0A1H1S001. Because your day is long and your tasks are sometimes all over the board, you know it’s important sometimes to have a pair of women's shoes that can take you from errand to task to work and back again. If you can find a pair that accomplishes just that - and doesn’t sacrifice comfort, good looks, or quality - then you’ve pretty much hit the shoe jackpot. Meet the Timberland PRO Women's TB0A1H1S 001 Purple Powertrain Sport Alloy Toe ESD Athletic Work Shoes. They go by “Jackpot” for short. Anti-fatigue insoles add that extra cushioning you need to get from A to B and back to A, while Ripstop nylon uppers add durability and flexibility to your steps. Alloy safety toes take the design up yet another notch by enhancing your safety at the workplace. These women’s shoes are made exclusively by Timberland, so you know they’re going to be drawing upon years of quality research, design, and technology. The shoe uppers are made from premium black Ripstop nylon in a lavender purple color with a cool, subtle black hex design screen printed in abrasion-resistant ink. The Ripstop nylon means that the shoes are lightweight, flexible, and breathable. In other words, they’re perfect for things ranging from weekend hiking to grocery store runs to job sites and warehouse floors. 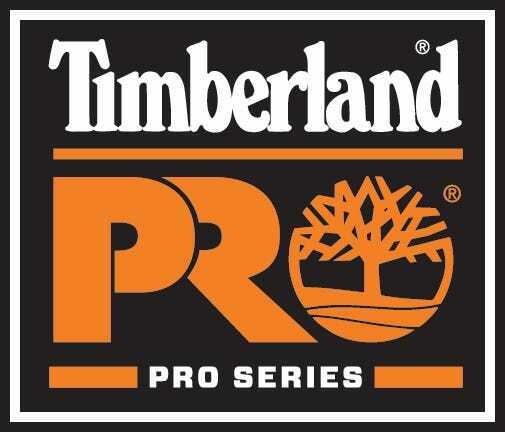 Speaking of job sites and warehouses, these hybrid Timberland PRO shoes are fitted with alloy safety toes built on Titan last, which provide all of the protection of steel toes minus the metal. That means they’re lighter in weight and more versatile, as well as safer for wear in areas where electrical hazards may be a factor. Non-metallic shanks add more feather-light structure and support, and conductive polyurethane midsoles provide superior static dissipation that works consistently across the surface of the women's purple athletic shoes. Your overheated feet will be grateful for the fact that these alloy toe ESD shoes are lined in breathable mesh fabric. Your friends and family will also be grateful for the fact that that mesh lining fabric is treated with exclusive anti-microbial technology to control odor, no matter how sweaty things might get. Finally, because one of the most important parts of any pair of women's shoes is the part that stands (ha!) between your foot and the floor (or ground, or ladder rung, or whatever else you step upon on a given day), Timberland has fitted this design with lightweight, well-built polyurethane outsoles featuring their own Anti-Fatigue Technology. This BASF super lightweight PU balances low density with flexibility, traction, and comfort. Keep the spring in your step at the end of the longest day, thanks to an inverted cone shape built into the soles that relieves pressure at the strike points and provides lift at the arches. The soles are slip-resistant and abrasion-resistant, too, of course. You'll have superior traction for all of the 10,000 (and then some) steps you take each day. That’s probably all that we need to say to convince you these are some of the best women’s work shoes on the market for athletic and work-related needs (or both). Trust us: you’re on the very edge of your own personal women's footwear revolution here. Welcome to Jackpot - aka the Timberland PRO Women's TB0A1H1S 001 Purple Powertrain Sport Alloy Toe ESD Athletic Slip-Resistant Shoes from Working Person's Store. I love the looks of these and in fact received quite a lot of compliments on them, but they could be a little wider in the toe area. I'm still trying to break them in, it's been 3 weeks and my feel still hurt after about 6 hours. I have worn safety shoes for 27 years. These Timberland's are by far the most comfortable and fun shoe I have worn. I broke them out for a first wear to visit a customer. I spent 14 hours walking and climbing stairs without any issues. My feet were never sore or tired. I would buy them again and again!! I ordered these because I love the color purple and Timberland is known for good shoes. I have not been disappointed. They are the most comfortable work shoes I have ever owned & I have been wearing Alloy or Steal toes for 30 years. I am on my feet all day and they don't get sore. Timberland PRO Shoes: Women's TB0A1H1S 001 Alloy Toe ESD Athletic Purple Powertrain Sport Work Shoes is being added to your cart.